Do you remember the first time you wrote a check for $100? The first $100 check I wrote was for my cell phone waaayyy back in 1997. Whoa….that brings back memories. At that point, it hadn’t even occurred to me to invest the 100 dollars – I was just happy to have my cell phone! What about your first $100 check? Or your first $1,000 check? I bet you weren’t wondering how to invest $1,000 dollars then, were you? Even better, your first $10,000 check? The first time I wrote a check for $10,000 was to pay off my student loan debt. That was, by far, the best check I ever wrote! For me the choice was clear, but where to put an extra $10,000 isn’t always an easy decision. I’m here to help! Here are 15 great ideas on how to smartly invest that extra cash. If you’re looking specifically for short-term investment ideas, we have suggestions for those, too. Or, if you have more to invest, check out the best ways to invest $20,000 dollars! If you prefer fixed income investments to equities, peer-to-peer lending offers an opportunity to earn interest rates that are well above average. What these sites do is bring lenders (investors) together with borrowers, to create an open lending environment that cuts out the banks, and their high rates and restrictions. This results in what is often more flexible loan terms for borrowers, and much higher interest rates for investors than what they can get on even long-term certificates of deposit. There are various peer-to-peer lending sites on the web already, and more seem to be coming up all the time. But the best established of the lot is Lending Club. Some people who invest on the platform are reporting double-digit interest rate returns. There is some risk to investing on peer-to-peer sites, but if your interest rates are high enough, you’ll have the ability to cover those risks, and still come out well ahead of more traditional fixed-income investments. I spoke with Lending Club and their recommendation was to start off with at least a $2,500 investment. Since you can invest as little as $25 in a single loan, this gives you the ability to diversify into 100 different loans and bring your risk level down greatly. Get a full explanation of how to use peer to peer investing in my Lending Club reviews for borrowers and investors. Another peer to peer lending option is Prosper. I experimented by opening accounts with both of them more than a year ago and I have been very pleased with my returns. If you want to put your money into a virtual autopilot situation, a robo-advisor may be exactly what you’re looking for. M1 Finance is a brokerage where you can invest in stock and ETFs for no fees. This gives them the largest number of no-fee stocks and ETFs of any brokerage online. What puts them in the Robo-Advisor category is that they have pre-made and managed portfolios where you can invest your money, still with no fees, automatically. You can also create your own auto investments, making M1 Finance one of the more versatile ways to auto-invest. What is Betterment? It’s an online investment management platform, often referred to as a robo advisor, because everything is handled automatically for you. Investment selection, asset allocation, rebalancing, tax loss harvesting – it’s all done for you, and at very reasonable fees. For example, the annual management fees just 0.35% – or $35 – on an account up to $10,000. And it drops to 0.25% when you exceed $10,000, all the way down to 0.15% when you reach $100,000. $10,000 won’t buy you much in the way of diversification with individual stocks, but it will be plenty with Betterment. If you want to be completely safe, you can invest the money in high-yielding CDs or a high-interest savings account. These days the best rates are coming from online banks. Right now Citbank has gotten very creative and is offering a no penalty 11-month CD at 2.05%. What this means is you can lock in the interest rate for 11 months and after the first seven days you can withdraw that money with no penalty charges. This is a highly competitive and flexible offer. Real estate is an excellent investment, no doubt about it. But $10,000 isn’t enough to make a down payment on the purchase of an investment property these days, not in most markets (unless your my buddy that’s mastered buying real estate with no money down). But that doesn’t mean that you can’t invest in real estate. There are plenty of REITs to choose from out there. The internet has made it extremely simple to get started in REITs. One of the most popular is Fundrise. If you want to get investing in real estate, Fundrise is hands-down the easiest way to do it. They walk you through the application process and then allow you to browse through all of the possible investments you can put your money in. They have a $500 minimum investment, which is the smallest you’ll find. With just $500, you can get use their Starter Portfolio. With this portfolio, your money will be put into several REITs. It’s a great way to get instant diversification. One of the key benefits of using Fundrise is the low fees. Most investors pay 0.30 to 0.50 in their invested capital in fees every year. This is a great way to invest your money without your returns being eaten by fees. If you prefer to own property, you can consider pooling your $10,000 with one or more other investors, and buying an investment property outright. Most people seem to prefer to invest their money in mutual funds, particularly when it’s a relatively small amount of money. But if you’ve been showing real ability to make money trading stocks on your own, this might be an opportunity to take that up to the next level. You can open an online discount brokerage account through companies like Etrade and TD Ameritrade. These platforms have all the tools that you need to become a sophisticated investor – including educational resources if you need it. And, the low fees are a godsend when you’re trading individual stocks. If you are interested in taking the next step with an online brokerage see our list of the best online brokerage accounts for all types of investors. Speaking of mutual funds, if you’re looking for a different kind of fund – like really different – check out an investment platform called Motif. This is a platform where investors come to create very unique funds, or motifs. You can invest in some out-of-the-box motifs, such as rising interest rates, solar energy in China, or a looming natural gas glut. With a minimum of $250 and for a fee of $9.95, you can even build your own custom motif investment with up to 30 individual stocks, based on whatever investment niche interests you, and whatever stocks you put into it. When we think of investing, we generally think of putting money into assets with the hope of getting a return on the investment. But the best investment that you can make are the kinds that you make in yourself. Anything that you can do to improve your knowledge and skills – that will either enable you to live better, or to earn more money – is a true investment. One of the ways to do this is to put some of your money into coaching programs. This is especially valuable if you are about to take on a new venture, but don’t have much in the way of relevant experience. If you can sign-up for a coaching program with someone who is actually doing what it is you would like to enter, it will save you a lot of time, effort, and money. As the saying goes, never try to reinvent the wheel. There are different coaching programs covering just about any area you can think of. And while we’re on the topic, check out my Strategic Coaching program to see what it can do for you. I absolutely love it! This is another example of investing in yourself. Whatever your career is, you should be looking to add any necessary designations for your field. They can raise your visibility, your credibility, and the willingness of customers and clients to do business with you. 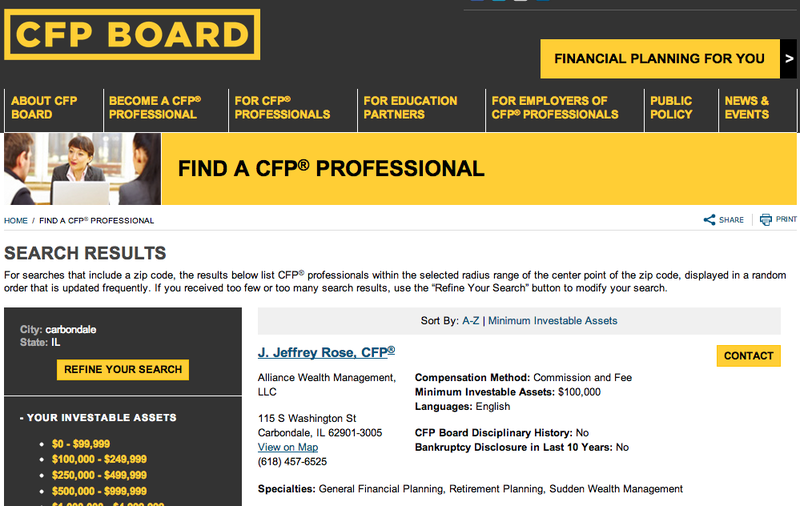 I acquired my certification as a CFP®, or Certified Financial Planner, and it enabled me to launch an entirely new and rewarding career. Find out what certifications represent the top of your field, and invest some money getting a designation for yourself. If you feel that your career is stagnating, and a lot of people do these days, going back to school could be the best investment of time and money that you ever make. $10,000 won’t get you a graduate degree at a name university, but it could cover much or even most of the cost of getting an Associates degree at your local community college. This money could present the perfect opportunity to retool into a new career and one that is a lot more relevant in today’s economy. According to the National Association of Colleges and Employers’ 2019 Job Outlook survey, US employers plan to hire over 16% more class of 2019 grads than they did 2018 grads. NACE’s data suggests that 2019 holds the most promising hiring outlook for new college grads in over 10 years. If the idea of returning to school to get a new degree doesn’t appeal to you, or if you are at a point in your life where it’s simply too inconvenient, you should look into taking online courses. There are all kinds of courses available that can help you move into a new career or business. This is yet another example of investing in yourself. By starting your own business, you put yourself in a position to take maximum advantage of your knowledge, skills and abilities. That increases the likelihood of your earning a high income. Leaving my old brokerage firm and starting my own financial planning practice ranks as one of the best business decisions I’ve made. It definitely had its scary moments, but the rewards have been amazing. Thanks to the Internet, it’s very possible to start your own business with just a few thousand dollars. Heck, I started this blog for less than $500! Choose the business that you want to go into, study how you can market the business through the Internet, then come up with a business plan. $10,000 should be more than enough to get started with. In fact, you better not start out with more than a $5,000 investment for an online business. There are plenty of ways to start a home-based business that require very little up front capital. One more point in starting a business. When you put money into a given investment, you’re doing so with the idea that it will be worth more money in the future. But when you have a business, it can provide you with an income for the rest of your life. That’s more valuable than just about any other investment that you can make. This can be a winning idea on so many levels, and you probably won’t need anywhere near $10,000 to make it happen. Choose a broad topic area – careers, technology, finance, investments, real estate, or just about anything your interested in and have at least above average knowledge – and build a blog around it. That’s what I did with my blog. As a financial planner it’s been easy for me to tackle personal finance and financial planning related articles on an ongoing basis. My wife had a different beginning with her blog. It started as a way to document our growing family, but after she realized she could make extra money blogging she started focusing on things that she was passionate about: motherhood, fashion, home decor and our pending adoption. I’m still in amazement at how often her home tour page has been shared on Pinterest – over 1 million times! The idea is to create a website with valuable content that will draw visitors to it. And as it grows, you will have opportunities to monetize it through advertising, affiliate arrangements (essentially, selling other peoples products), or as a platform to sell your own products and services from. This could be a way of building a side business, rather than taking the plunge into a full-time venture. You can do it as a sideline until you are ready to ramp it up to full-time. And you can move at whatever pace is comfortable for you. But once you get going, a blog can be an incredible source of new and exciting opportunities – as well as income. Podcasts are basically blog articles set to audio. But they have the advantage that they can also be placed on other websites for greater exposure. And just as is the case with a blog, there are ways that you can monetize podcasts. The simplest way is to do a series of podcasts and solicit listener donations. This can work beautifully if you have a loyal following. You can also get advertising sponsors, in much the same way that you would for a blog, who would pay for a mention in your podcast, or on the site where the podcast appears. If you have a talent for finding bargains, but have never had the inclination to sell some of those bargains for profit, Amazon FBA is probably the most hassle-free way to do it. FBA stands for Fulfillment by Amazon, and that’s exactly what they offer. You deliver the items you want to sell to Amazon, and then market them on the site. Once they have been sold – in the usual way that sales take place on Amazon – the company will handle the shipping for you. It’s one of the easiest ways to run an online business. This is the most risk-free way to invest $10,000 – or any amount of money – and it provides a virtually guaranteed rate of return. Let’s say that you have a credit card with an outstanding balance of $10,000, that has an annual interest rate charge of 19.99%. By paying off the credit card, you will not only get rid of the debt permanently, but you will also lock in what is effectively a 19.99% return on your money. No, it won’t mean that you’ll be collecting a 19.99% rate of interest as a cash income on your money, but it will mean that you are no longer paying it – which is virtually the same thing. Here’s another plus: the 19.99% that you will earn on your money (by not having to pay it out every year) is income that you will not have to pay any tax on. If you were receiving 19.99% on $10,000 directly, a large chunk of the income would have to go to pay income taxes every year. With inflation, $10,000 may not seem like a lot of money these days, but it’s plenty if you want to get into some interesting and imaginative investments. You can use them as an opportunity to grow your nest egg into something much, much larger. It’s even enough for you get into three or four of these investment ideas, which will give you an opportunity to really grow your money. Give a couple of these a try and see if they’ll work for you! This is by far one of the best straight to the point, easy to follow articles I’ve read on what to do with $10K, I’ll definitely try some of these steps! Thank you so much! Nothing about US Treasuries, bonds, Index funds, or finding a few friends to start an investing club? Hi Jason – You may have a valid point. The idea of finding friends to start an investing club is a good one. But USTs and bonds are mostly capital preservation holdings, not investments that will grow your money. As to index funds, we were just going for some strategies that are a bit different. I liked your article and I have read many similar articles. This one stood out for me.. I would strongly suggest steering very clear of lendingcorp. Shares started in 2015 at $25.00. Less than three years later today, $2.70. I don’t know enough about it to say that it won’t bounce back, but I did read the company is facing FTC suit for hidden fees. Thanks for the heads up Mantis. Hi Paul – No one can guarantee you’ll make 10% on your investment in 8 months. Nor can anyone guarantee you won’t lose money on said investment. Anything you invest in with that type of goal will be a high risk investment, where you’ll be just as likely to lose money. If you’re looking to invest for 8 months, I’d go with something safe, like a CD, so you don’t lose money. Great article!! A great starting point for someone who is new to this platform. Hi Sue – There’s no way to earn higher than average rates without taking on some risk. But since you don’t want any risk, your options are pretty much limited to either high yield bank investments (online banks pay the highest) or US Treasury securities, which pay close to 3%, but you’ll have to tie up your money for 5 – 10 years to get that kind of rate. You can look into Treasuries at Treasury Direct, the US government’s portal. 15 should be #1. No debt=happier life. Trust me. great article and I love how you broke down the debt as an investment payoff that you don’t have to pay out by year-end. Brilliant way to look at credit card debt, truly a great investment to pay yourself first. Also have enjoyed hosting a podcast about my touring band Sweet Little Bloodhound, “SLB Indie Trailer,” and have appreciated your nod to John Lee Dumas’s podcast, truly a great listen. As well as “Start-up” for businesses looking to grow with investors. Thanks Jeff. Great article! I prefer to combine investments. Do not put all eggs into one basket. Invest some money into stock market: open an account on etrade or interactive brokers and subscribe to some one good stock newsletter with investment ideas, such bulltips.com, but other part invest in small local business. Nice list. I think people forget they can invest in themselves. I spent the time and money to finish the CFA. Good afternoon. Great post!! I totally agree with all of the tips on your post. I was wondering what is your opinion about purchasing CDs from institutions based in some countries that may lack stability in the Middle East and South America. I know some of them have great rates of return. Thank you in advance for your response. WOW, great article Jeff and thank you for the kind mention…I am honored!